The BBC has unveiled details of its election programmes - with Theresa May and Labour leader Jeremy Corbyn set to take part in Question Time specials. David Dimbleby will host the programmes in which Mr Corbyn and Mrs May, the Conservative leader, will face audience questions consecutively on 2 June. SNP leader Nicola Sturgeon and Lib Dem Tim Farron will appear on 4 June. There will also be a live debate featuring senior figures from seven parties on BBC One on 31 May. The debate from Cambridge, moderated by Mishal Husain, will feature Conservative, Labour, Liberal Democrat, SNP, Plaid Cymru, Green Party and UKIP people. Other programmes include Election Questions to Plaid Cymru leader Leanne Wood from Swansea on 4 June, and Election Questions to UKIP leader Paul Nuttall from Bristol. The final BBC debate will be a Newsbeat Youth debate on 6 June with an audience of 18-25 year olds hosted by Tina Daheley in Manchester, featuring seven senior politicians from the main parties. It will be broadcast on BBC Radio 1 and the BBC News Channel at 20:30 BST and then on BBC One at 22:40. In addition, Mrs May and her husband Philip are also expected to appear on BBC's One Show on 9 May, with Mr Corbyn to appear later during the campaign. Jonathan Munro, head of BBC Newsgathering, said: "We have an exciting line up of special programmes over the General Election period... bringing Theresa May and Jeremy Corbyn in front of the same Question Time audience on the same night to be quizzed by the public. "It is firmly in the public interest for audiences to hear from those seeking election. We know they connect with these formats because they are a public moment to focus on and audience members from all across the country get the chance to ask politicians their own questions." The announcement of the programmes comes after Theresa May said she would not take part in TV debates with Jeremy Corbyn ahead of the general election, saying she preferred "to get out and about and meet voters". 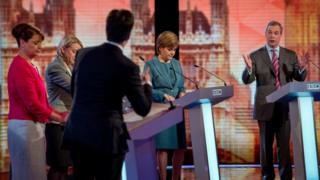 The PM's stance prompted Mr Corbyn to insist he would not take part in any head-to-head TV election debates without Mrs May. He said the only debate he wanted was one between the "two people who could form the next government". The key points of the BBC's announcement this morning is that, first, something - as opposed to nothing - is happening, which is a victory for BBC audiences. Second, the government will be happy that while Theresa May is participating (in one of two special editions of Question Time), she isn't going to share a stage with Jeremy Corbyn. And third, both the Tories and Labour face an intriguing choice about who they will put up for the seven-way debate moderated by Mishal Husain. Green Party co-leader Jonathan Bartley said it was "beyond a joke" that UKIP would be the subject of a dedicated questions programme while his party was not. He said the Greens had outperformed UKIP in last week's local elections. The BBC said its decisions about coverage took into account past electoral support over two electoral cycles, as set out by industry watchdog Ofcom, and not just recent local election results. ITV has said it will hold an election debate with or without Mrs May or Mr Corbyn in prime time on 18 May. The BBC plans include more than 10 hours of prime time TV programmes and formats for audiences to engage with the election choices. Mrs May and Mr Corbyn will appear on the Question Time Leader Special in York, while the show featuring Mr Farron and Ms Sturgeon will be broadcast from Edinburgh. Question Time will also be devoting a programme to the election in Northern Ireland. Throughout the week of 22 May, BBC One will air a series of prime time Andrew Neil Interviews at 19:00 BST, with one-to-one interviews with Theresa May, Jeremy Corbyn, Tim Farron, Paul Nuttall and Nicola Sturgeon broadcast in England, Wales and Scotland. A sixth interview with Leanne Wood will air on BBC One in Wales. The General Election Results Night Special will be led by David Dimbleby with Mishal Husain, Emily Maitlis and Jeremy Vine. Huw Edwards will take over in the morning as lead presenter guiding the audience through the day's main events. A final Question Time Election Special will be live on BBC One on 9 June. There will also be full online coverage throughout the election campaign and on results night, including a rolling live updates page. A BBC Election Bot will also send updates to subscribers via Facebook Messenger.